The shilling (often written as 1s or 1/-) coin was a sub-division of the pre-decimal Irish pound, and was worth 1/20th of a pound. 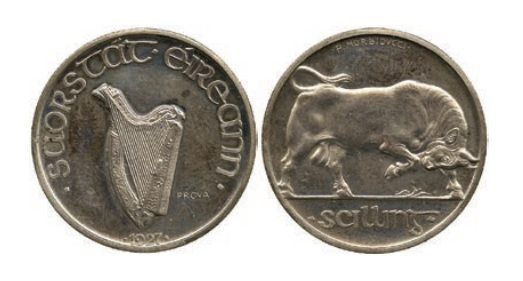 The original issue of the coin from 1928 until 1942 contained 75% silver; thus this Irish coin had a higher content than the equivalent British coin. These earlier coins were noticeably different from their later counterparts as they were of a lighter hue than the later (1951-68) cupro-nickel coins, and they resisted wear less well. 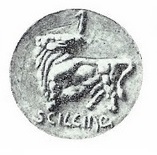 The cupro-nickel coin contained 75% copper and 25% nickel. In 1927, a competition was held to design a new Irish coinage and entries were received from a short list of invited artists. 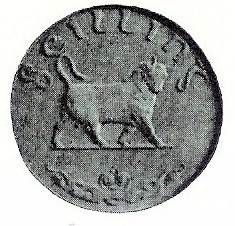 Their shilling designs were all of a bull, as suggested by the committee brought together to run the competition and judge the designs. The following are some of the rejected designs + the original design by Percy Metcalfe. Metcalfe’s original design was modified by the Royal Mint to improve metal flow and other technical minting issues. 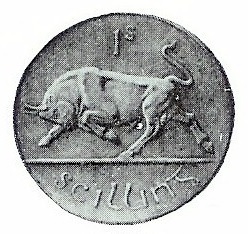 The reverse design featuring a bull was by English artist Percy Metcalfe. The last shillings were minted in 1968 but when the currency was decimalised, this coin continued to circulate alongside its replacement five pence (which also featured a bull on the reverse). The shilling was finally withdrawn from circulation on 1st January 1993 when a smaller five pence coin was introduced.